Ace Pro Screensaver Creator is a powerful screensaver creator yet very easy and simple to use. Create either slide-show or advanced living screensaver easily with Ace Pro Screensaver Creator in just a few simple steps. 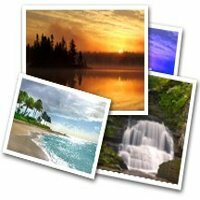 Unlike ordinary screensaver creator, Ace Pro Screensaver Creator offer realistic living scenes which will transform your computer to life, with added flexibility to edit and create the screensaver that suits you needs, either for personal enjoyment or commercial purpose. Add living scenes that you have created using Nature Illusion Studio or any photos into Ace Pro Screensaver Creator. Ace Pro Screensaver Creator also supports jpeg, png, gif, and most popular image formats. Furthermore you can apply more than 100 transition effects into your screensavers to make the transition between images look smooth and beautiful. Ace Pro Screensaver Creator provides a complete set of shareware features so you can start selling your screensaver in no time. Ace Pro Screensaver Creator comes with built-in setup builder, it means your screensaver will be ready for mass distribution with just a single click. Customize the user interface of your screensaver setting by changing its skin, or you can also totally create a new skin with built-in Skin Editor. Show a customized window/screen when screensaver is running in trial mode or when expired, you can use it to show any informations that you want, like assisting on how to purchase your screensaver, etc.